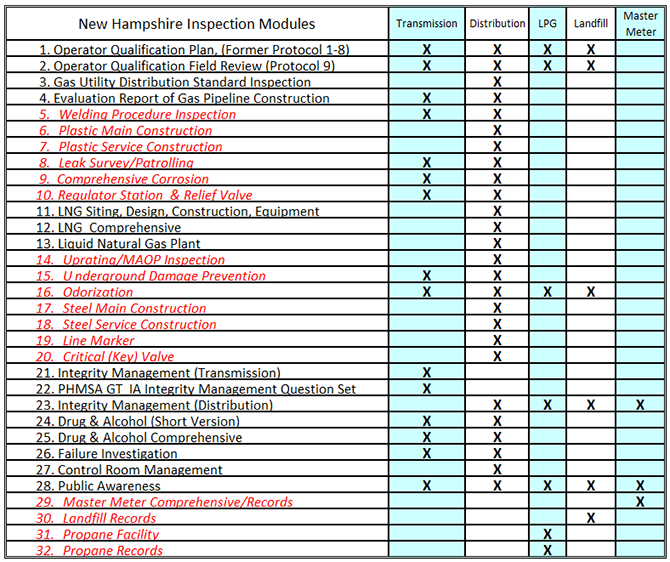 New Hampshire incorporates 32 versions of Inspections for Transmission Operators, Distribution Operators, LPG Operators, Landfill Gas Operators and Master Meter Operators. 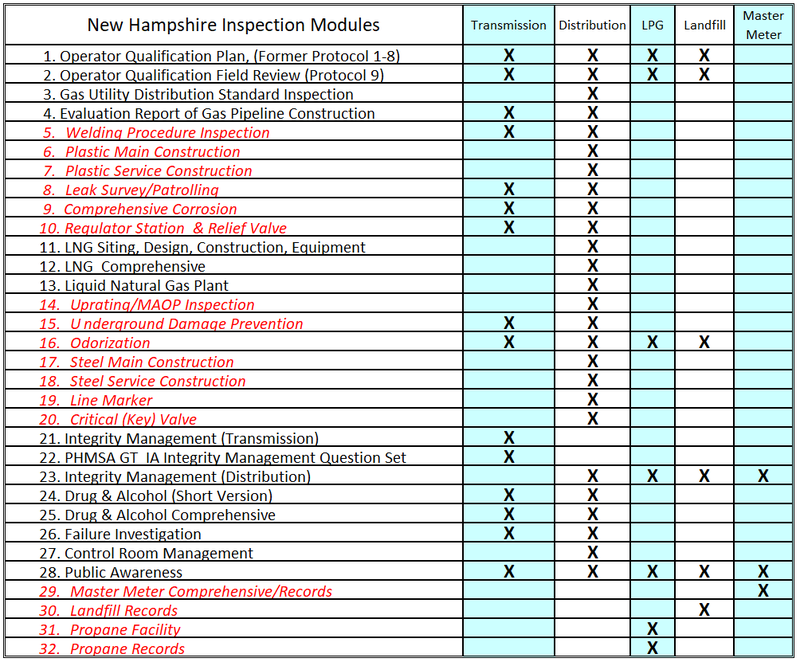 (Red Italics indicate Inspections which are New Hampshire specific and do not solely use PHMSA forms and guidance). These inspections are conducted over various intervals ranging from 1 to 5 years. When aggregated, the inspection forms are designed to verify overall compliance with federal regulations, applicable state rules and applicable Commission Orders. Thorough pre- inspection-which may involve acquainting oneself with the procedures anticipated to be used for the type of activity that is being inspected. Reviewing an operator’s specific expectations regarding documentation that the operator requires to be recorded is an important first step of a successful inspection. Another important activity of meaningful inspections includes conferring with fellow inspectors of previous inspection results. Pre-inspection routines also familiarization of applicable guidance material, prior history of inspections and compliance actions for that operator. On-site field monitoring or monitoring of work centers to see if operator’s procedures are being followed and that they are consistent with ensuring compliance with 49 CFR Part 192, 49 CFR Part 193, or Puc 500 regulations and overall safe design, construction, operations and maintenance is another important element. Inspections may take place at any reasonable time and location. A “reasonable” time typically would be considered working hours on regular work days but could also include occasional inspections on weekends, holidays or night shifts. Inspectors may examine the records and properties of persons to the extent such records and properties are relevant in determining Commission order or rule compliance. Inspections may be based upon the following: routine scheduling, a complaint received from a member of the public or any party, information obtained from a previous inspection, a pipeline accident or incident and whenever scheduled by the commission. Distribution operators notify the Safety Division each morning of crew locations and pipeline work activities. Inspections can be either scheduled or unscheduled, that is, unannounced inspections. Scheduled inspections typically involve visits to pipeline operator facilities to interview managers, examine records or inspect specific facilities. Unscheduled inspections are usually field visits to construction, repair or incident sites. Scheduled inspections are most appropriate for Integrity Management Inspections, Operator Qualification Program Inspections, Control Room Inspections, Public Awareness, and other program inspections where a complete and thorough review is necessary. These are often performed as a team of inspectors. The inspection team typically has assigned a lead based on completed training and expertise of the subject matter. Unlike PHMSA, New Hampshire does not use an Integrated Inspection process in which some operators may not necessarily receive a full inspection. Such an approach is not necessary within New Hampshire based on the number of operators, inspection units, and the amount of pipelines measured against applied inspection resources. For more information on inspections types see PHMSA’s Inspection Type Glossary and PHMSA’s Pipeline Safety Inspection websites.